The Department has an active and exciting student association, the Communication Studies Students Association (CSSA). The CSSA was created by our students in 2005, it seeks to enhance student participation in York's vibrant intellectual community as well as provide support and information for students on their way into the job market. The CSSA was also a proud recipient of the 2006 award for largest contribution to the student body. 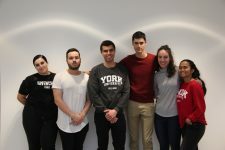 The CSSA aims to facilitate an organization where students can enhance their university lifestyle by partaking in club events and making new friends and connections. The goal of the CSSA is to mix academic and applied communication themed events and club socials.